When children develop a habit of head banging, their parents are often concerned. They express fear that this habit might hurt their child, perhaps even causing brain damage. The unspoken fear is that their child might have autism. Head banging, head rolling, and body rocking are all common rhythmic habits (as is thumb sucking). Many theories have been put forward to explain them. Perhaps the rocking and even the head banging provide a form of pleasure related to the movement. This joy in movement is called our kinesthetic drive. All infants are rocked by their mothers when they are carried about in utero. Later on, they enjoy being held and rocked in parents’ arms. Movement activities continue as kids grow: the pleasure of jump rope, swings, slides, amusement park rides (bumper cars!) and dancing. These activities all engage the vestibular system of the brain. The amount and type of movement that provides pleasure varies from child to child. Kids who are under-stimulated (those who are blind, deaf, bored, or lonely) head bang for stimulation. But children who are overstimulated (in an overwhelming environment) find these rhythmic movements soothing. For some children, head banging is a way to release tension and prepare for sleep. Some kids head-bang for relief when they are teething or have an ear infection. Some kids bang their heads out of frustration or anger, as in a temper tantrum. Head banging is an effective attention-seeking maneuver. The more reaction children get from parents or other adults, the more likely they are to continue this habit. Generally, healthy children do not head-bang in order to injure themselves. Up to 20 percent of healthy children are head-bangers for a time. Typically, head banging appears in the latter half of the first year of life and generally ends spontaneously by four years of age. Boys are three or four times more likely to be head-bangers than girls. Head banging, head rolling, and body rocking are also each far more common in autistic children, children with developmental delays, and children who have suffered abuse or neglect. What are the symptoms of head banging? The child seems compelled to rhythmically move his head against a solid object such as a wall or the side of a crib. Often he rocks his entire body. For most children it occurs at sleepy times or when upset (often as part of tantrums). This behavior can last for minutes at a time — or sometimes for hours. It can even continue once the child has fallen asleep. No, although other people’s actions can promote head banging. How long does head banging last? These rhythmic motor activities are part of normal behavior in healthy infants and young children (and healthy young monkeys for that matter!). This behavior is abnormal, though, if it persists beyond the early years. Normal head banging usually goes away by age four. Any child who is still head banging beyond three years of age deserves further evaluation to be sure it is a normal habit. How is head banging diagnosed? Lack of pointing — By fourteen months of age most children will point at objects in order to get another person to look. 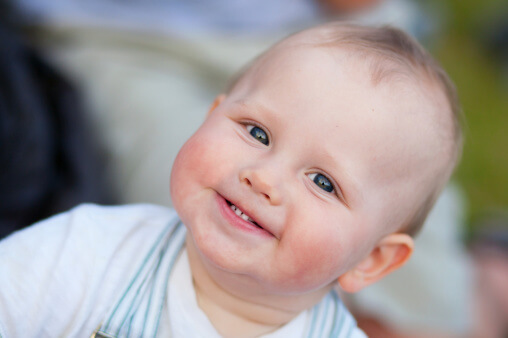 Lack of gaze-following — By fourteen months, infants will often turn to look in the same direction an adult is looking. Lack of pretend play — By fourteen months, children will begin to play using object substitution, e.g. pretending to comb the hair with a block. All three of these behaviors are typically absent in children with autism.If a child begins even one of these three behaviors by 18 months, the chances of ever developing true autism are very small. Again, head banging beyond age three deserves further evaluation. How is head banging treated? Most children will outgrow the habit on their own. You can speed up this process by reacting to it in a matter-of-fact way. Pretend not to notice. And if it is part of a tantrum, do not give her whatever she threw the tantrum to get. When you notice her head banging, you might be able to get her to stop for the moment by distracting her or engaging her in a different activity. By decreasing the amount of time she spends in this habitual activity, she will outgrow it more quickly. How can head banging be prevented? Preventing head banging from becoming a habit is best accomplished by responding to it as described in the treatment section above. How do you prevent head injury? Typically, healthy toddlers don’t seriously injure themselves with this habit. Pain prevents them from banging too hard, but even if it didn’t, children under 3 don’t generate enough force to cause brain damage or neurologic problems. The front or front/side of the head is the most frequently struck. A toddler’s head is built to take all of the minor head trauma that is a normal part of learning to walk and climb. Healthy infants and toddlers who are head-bangers grow up to be coordinated and completely normal children. Curiously, one large study of this habit in healthy children found head-bangers to be measurably advanced compared to their peers. If anything, then, head banging in healthy children can be a sign of increased intelligence.